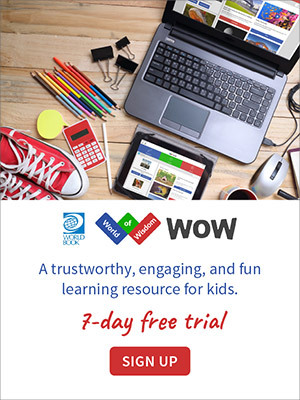 Instill a lifelong love of learning in your children with World Book’s print and digital products. With series and individual books for every reading level, World Book will give your student a leg up both in and out of the classroom. How did the Chameleon outwit Olokun the sea goddess? Through engaging narration and colorful illustrations, Myths and Legends of Africa helps children explore the mythologies and legends of the Ashanti, Ganda, Zulu, and other African cultures. Learn where Jaguarandis, hellbenders, and more live, what threatens their existence, and what is being done to save them. Detailed maps provide visual learners with a reference for each animal’s range. A helpful glossary and index direct readers to the most important terms and topics. Learn where Dugongs, staghorn coral, and more live, what threatens their existence, and what is being done to save them. Detailed maps provide visual learners with a reference for each animal’s range.